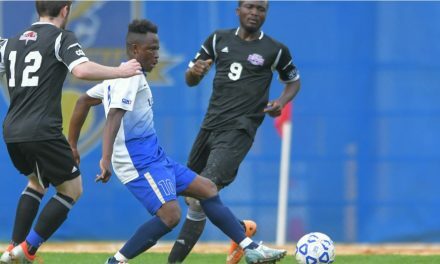 BRONX, N.Y. – After a thrilling 3-3 draw, Lehman College men defeated Hunter College, 5-3, on penalty kicks in a City University of New York Athletic Conference quarterfinals at South Field Wednesday night. 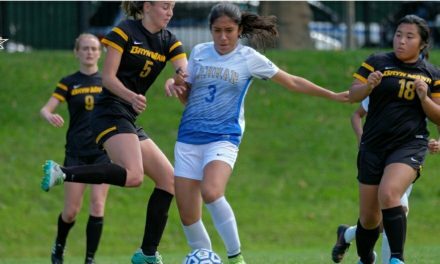 Third-seeded Lehman will take on second-seeded Baruch College in the semifinals at Brooklyn College Saturday. No. 6 Hunter jumped out to a 2-0 halftime lead after tallies from midfielder Adam Pine and forward Blaise Enama in the 18th and 25th minutes, respectively. The Lightning got on the board in the 57th minute off a goal from midfielder Mubarack Ouro, who low shot from left side got past goalkeeper Noah Dougherty. Midfielder Omar Moro tied the match at 2-2 in the 76th minute off an assist from defender Abdu Tchakoura. A penalty kick from defender Michael Merlo gave Hunter a 3-2 advantage in 82nd minute. However, two minutes later, Moro notched his second goal of the match to equalize at 3-3. The shootout remained tied after two rounds, when Moro recorded Lehman’s third shot for a 3-2 lead. Hunter’s third attempt from midfielder Nikola Ristovic was saved by goalkeeper Chris Mulholland. After each team exchanged goals in the fourth round, midfielder Marcus Folks scored the winning penalty for Lehman.